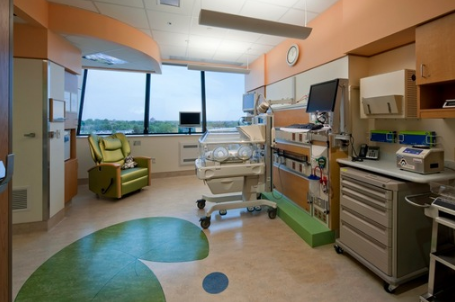 Leach Wallace Associates provided professional engineering services for the fifth floor of the East Addition of Children’s National Medical Center (CNMC), to become the new Neonatal Intensive Care Unit (NICU). The new NICU required approximately 27,000 SF of space on the floor, with access to the adjacent rooftop helipad. The fitout included 40 primarily private NICU beds, six isolation beds in private rooms, and provisions for six future NICU beds. In addition, space was provided for parent sleeping rooms, on call rooms, nursing stations and work areas, utility rooms, office and conference space, and other related support space. Extended within the fifth floor ceiling space from those connection points in the core and shell package were the supply and return air, heating hot water, domestic water, sanitary and vent piping, and medical gas systems. A new isolation exhaust fan was located on the roof of the sixth floor above and ducted, via an existing shaft to the fifth floor ceiling space. General exhaust fans provided under the core and shell documents were rebalanced or replaced to accommodate the additional general exhaust air needs of the fifth floor fitout . The project required upgrades and extensions to the various existing electrical systems; including, normal and emergency power distribution, lighting, fire alarm and detection systems, telephone and various internal communications systems. Each NICU bed location was served from two separate critical branch distribution networks for improved reliability and ease of maintenance. Indirect lighting was installed throughout all patient care areas with dimming and lighting controls.